Now that there's a slight chill in the air I can finally start cooking and baking more comfortably. There's nothing like making comfort food while comfortable, right? I'm the type to bake homemade pizza with the oven at 500° when it's 90° out, making even the dogs miserable. Lentils have never been a staple in my family, in fact we're the black/red/garbanzo type but I know tons of vegetarians eat 'em constantly. 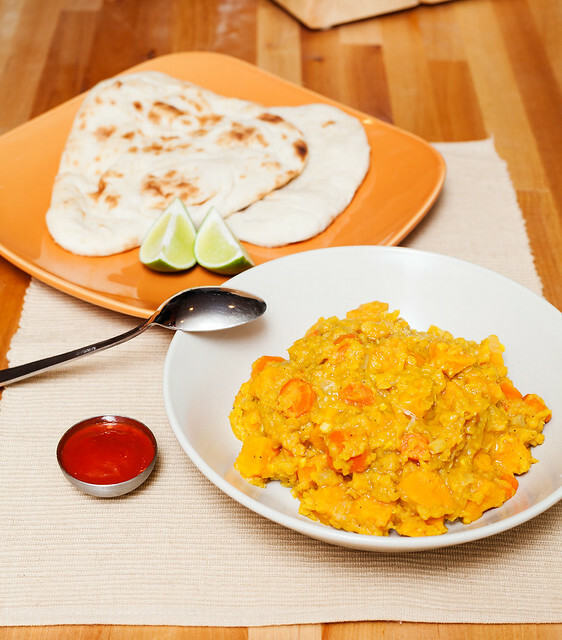 Being a rookie in the lentil department, I decided to find a super simple recipe for Red Lentil Curry. 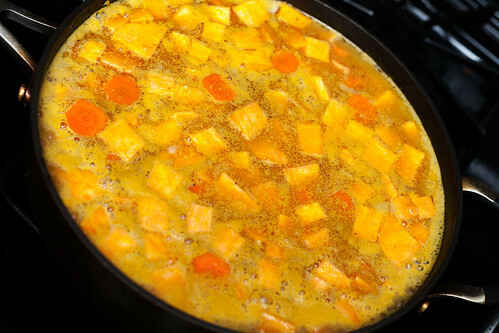 I used sweet potatoes in place of russet, and upped the ginger, garlic and curry powder. Had I planned better I would have added more spice to balance out the sweetness. Instead, we busted out some Sriracha after the fact. I'm sure that's making some of you cringe, but my taste buds aren't sorry! Now this next dish... Is it a casserole? A hash? What exactly does adding "bake" to end of the name even mean? I don't have answers to any of these questions but I can tell you this concoction was delicious. 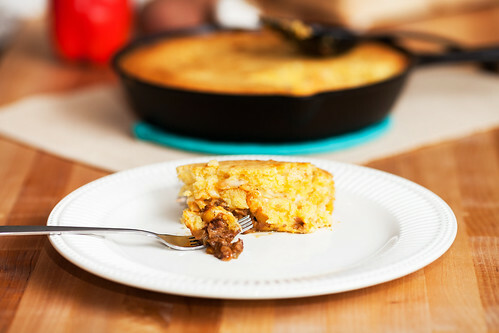 I can't take all the credit though, I found the Monster Meat Cornbread Bake recipe (lol) on bettycrocker.com of all places! It's another quick and easy one-pan meal that I totally see myself making often during these cooler months. I'd venture to say my favorite part is not having one billion dirty dishes afterward since I'm notorious for using every dish in the kitchen when I cook. I'm sure Andrew also appreciates this. It's packed with layered onions, bell pepper, mashed sweet potatoes, lots of sharp cheddar cheese and topped with cornbread. Where's the monster meat portion? Well, I subbed veggie sausage for the smoked turkey sausage the recipe calls for. When it comes to cornbread, I've always been partial to Jiffy and that little blue and white box that probably sparked an interest in package design in baby me ages ago. However, I'm excited to try making it from scratch next time! 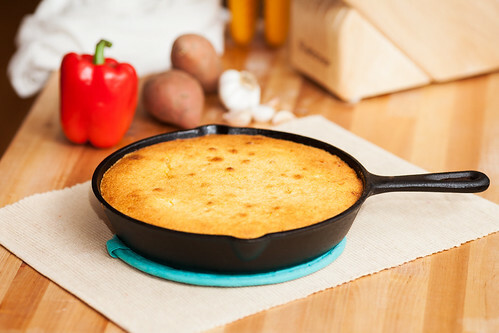 Do you have any amazing cornbread recipe recommendations? Give me links! Thanks for sharing, I love your photos. Oh, I've never had shepherd's pie before. 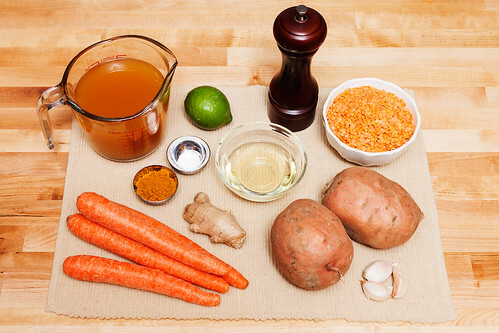 I just googled it and it looks delicious (and easy to veg up). I also just checked your recipe tag to see if you had one posted yourself lol! The lentils were good and so filling! I'm excited to try making soup with them next. And I'll take your photo compliment even though Andrew totally shot these! I'd do some damage on that cornbread bake! It also just so happens that yesterday I was reading a recipe for sweet potato *cookies* (seriouseats.com) and it only used a half cup of mash... I think this would be a great dish to make on the same day. Oh, and here's my recipe for cornbread. Not sure where to attribute it to, but it is good and works in a variety of pans. 1Preheat oven to 400°F. Spray an 8x8 or 9x9-inch baking pan with nonstick cooking spray. 2Sift the dry ingredients together in a mixing bowl. 3In a small bowl, lightly beat the egg with the maple syrup. 4Add the milk, the oil, and the egg mixture to the dry ingredients and stir until everything is combined (mixture will be slightly lumpy). 5Pour batter into prepared pan and bake for about 25 minutes, until the cornbread is browned slightly at the edges and a knife inserted in the center comes out clean. Thanks for the recipe. Jaimielee, let's try this! OMG, same! My husband is a meat eater but I refuse to cook/handle it. I have to admit I'm not actually a vegetarian though, I still totally eat seafood so that's usually our happy medium. Often we skip it altogether and go full-on vegetarian. Let your husband know the monster meat dish is SUPER good, the veggie broth and fake meat substitute combined with the heartiness of everything else more than makes up for it! Yikes! Comments have gone all wonky with the replies but thanks for your recipe, Tom. I would have never thought to add in maple syrup but it sounds delicious. 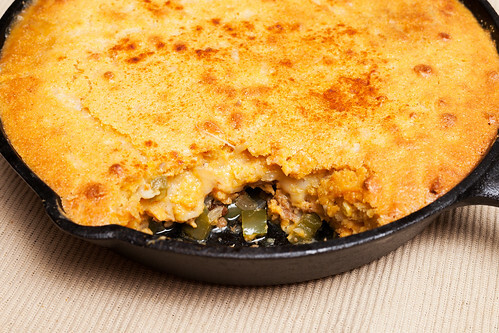 I definitely recommend the cornbread bake, we'll probably be eating it weekly during Chicago's winter months. And sweet potato cookies? I definitely need to look that up! Hah, it alllll makes sense now! I love that your husband commented and spoils you with cooking. So sweet!